All Teams must be registered with USSSA to participate. Teams that need to register with USSSA may do so HERE. Teams can register for the National Championship and secure entries by clicking HERE. All Teams will pay a $375 upfront gate fee that is due 2 weeks prior to the event or June 26, 2019. We strongly recommend that this is paid at the time of team entry! If a team misses the deadline for Gate Fee payment they will bring $495 (cash only) to the event to turn in at check-in prior to first game. No passes sold onsite! Typical cost for event passes at $30 per for adults and $25 for 12-18U or day passes at $10/$8 are far more expensive than this one time upfront discounted fee. Team $375 Spectator fee must be paid online after you login from your shopping cart. All teams needing Hotel accommodations will book through our Hotel Service Partners - This is MANDATORY! Michigan USSSA Fastpitch has partnered with Traveling Teams to assist our out of town teams with hotel accommodations. For our National Championship events, we require that all teams requiring lodging reserve their hotel accommodations through Traveling Teams. Michigan USSSA Fastpitch has opted to implement this stay-to-play policy for this event because of the many benefits its offers teams. All opening ceremonies activities will be at C.O. Brown Stadium inside the Bailey Park Complex. Gates will open @4:30 on July 10th. Manager's Meeting - at C.O. Brown Stadium - Meeting in the bleachers behind home plate. Maximum 1 manager per team. Your State Director must approve your online roster, this is your team's official roster, NO printed rosters accepted or recognized. If your adding pick-up players contact your state director. Teams WITH USSSA insurance will NOT need to email a copy of your insurance certificate. We have your copy online. Teams WITHOUT USSSA insurance will email a copy to bob.wilkerson@usssa.com by deadline of two weeks prior to event. Merchandise Sales - Tables with official tournament t-shirts and other apparel along with official tournament pins will be sold during opening ceremonies and daily until gone at Bailey Park. Family Meals - The Battle Creek Bombers baseball team is offering a fantastic value. Teams can purchase meal tickets only through pre-ordering from the flyer below. Each meal ticket sold comes with a ticket to Friday nights game. For teams that are unavailable on Friday night, you may use the ticket on Saturday night. The Bombers are home during all days of the National Championship. Family meal with game ticket included available through pre-sales orders only. 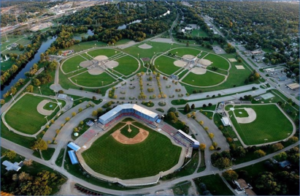 The Battle Creek Bombers play out of the highly competitive Northwoods League. Great Lakes National Championship Team Parade - Teams will line up (left field foul line) and be announced to parade in. Show your team SPIRIT!! Team voted by tournament staff to be the most spirited in their age division will win player awards TBD. Pro DJ's Music and Social Activities - Pro DJ's will provide music during parade and entertainment after parade. Pin trading & gift exchange (not mandatory but truly a memorable experience) will happen during the social activities after parade. This is a great way for players to meet new friends from all over. Pro DJ's will entertain with their energetic style and keep the fun going with line dancing and so much more. The Bombers will have on field games and Moe Skeeter their mascot will be hanging out to sign autographs, dance and have fun with the crowd! We will have Fun Services Entertainment Company onsite as well with additional fun stuff to do for all in attendance. Rules: All playing rules shall be governed by the official USSSA Fastpitch softball rulebook and national by-laws. The rulebook online at www.usssa.com will always supersede the latest printed version if a discrepancy exists. Awards: The full size package that will be awarded for divisions with more than 32 teams consists of team trophies to the top six teams, individual awards to the top six teams, team sportsmanship award, outstanding pitcher award, outstanding offensive player award, outstanding defensive player award & MVP award. Balls & Bats: We will use the Bownet USSSA College/Pro level leather ball with raised seams, .47 core. All bats must bear the USSSA thumbprint logo with a manufacturer’s stamp of 1.20 BPF and must be in accordance with the 2017 bat regulations. Submit your team's gate fee payment at www.usssa.com from your team's schedule using the credit card shopping cart provided. Must be paid no later than June 30th. Enter team roster online from your USSSA Team Management page after you login at www.usssa.com/fastpitch. Send the guardian invitation for approval once players are uploaded. All players must be guardian approved. Bring a printed roster signed by all players and parents to hand in at Manager's check-in along with copy of your proof of insurance. More information will be added as we move forward, check back to stay up to date!